This article investigates the temperature reduction impact of major climate policy proposals implemented by 2030, using the standard MAGICC climate model. Even optimistically assuming that promised emission cuts are maintained throughout the century, the impacts are generally small. The impact of the US Clean Power Plan (USCPP) is a reduction in temperature rise by 0.013°C by 2100. The full US promise for the COP21 climate conference in Paris, its so-called Intended Nationally Determined Contribution (INDC) will reduce temperature rise by 0.031°C. The EU 20-20 policy has an impact of 0.026°C, the EU INDC 0.053°C, and China INDC 0.048°C. All climate policies by the US, China, the EU and the rest of the world, implemented from the early 2000s to 2030 and sustained through the century will likely reduce global temperature rise about 0.17°C in 2100. These impact estimates are robust to different calibrations of climate sensitivity, carbon cycling and different climate scenarios. Current climate policy promises will do little to stabilize the climate and their impact will be undetectable for many decades. 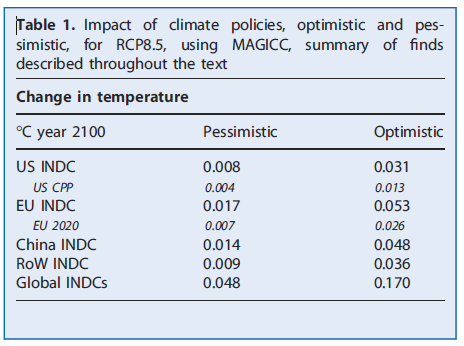 Table 1 below summarizes the global warming reductions plausibly projected for the main separate and total combined INDCs. For purposes of analysis, Lomborg makes the rosy assumptions that all nations do what they promise, and there is no carbon leakage (i.e. capital does not flee from carbon-constrained Western nations to China and other less-regulated developing countries). Estimates in the “Pessimistic” column assume nations achieve their promised reductions but then allow emissions to trend upward towards original baselines. Estimates in the “Optimistic” column assume nations hold their emissions constant after 2030. Figure 11 below shows the stunning climatological insignificance of the Paris climate treaty. (1) Like its predecessor, the Kyoto Protocol, the COP 21 treaty is likely to be a costly exercise in futility — substantial economic pain for no discernible environmental gain. 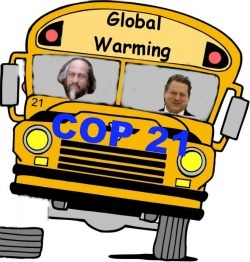 (2) Like Kyoto, COP 21 is envisioned by its architects as a first step. Decarbonizing of global energy is to be achieved through a succession of more aggressive emission-reduction targets beyond those specified in the current INDCs. (3) Those who say we must adopt the Paris treaty for the sake of our children and grandchildren have not thought things through. Under the global regime envisioned by COP 21, each generation will have to make greater economic sacrifices than their parents did; each will enjoy less access to affordable energy than their parents did. (4) What is not economically sustainable is not sustainable, as climatologist John Christy likes to say. Since developing country emissions already exceed and are increasing much more rapidly than industrial country emissions, the biggest emission cuts under COP 21 and beyond must come from precisely those countries that can least afford to cut emissions. Sooner or later, the wheels fall off the bus. (5) Lomborg says his analysis “clearly indicates that if we want to reduce climate impacts significantly, we will have to find better ways than the ones currently proposed.” Based on previous writings, I think he means that decarbonizing global energy cannot be mandated according to a political timetable. It will only occur when zero-emission energy does not require market-rigging taxes, subsidies, and mandates to “compete” with conventional energy. Only when non-emitting energy is too cheap even for poor nations to resist will global emissions rapidly decline. Next post: Is War on Coal the Cause of Confounding Increase in U.S. Electricity Bills?